After all the alterations (I needed to do two muslins of the front bodice piece), I cut and sewed Sewaholic’s Belcarra Blouse in a day. Simple lines and easy to make. A great basic top. 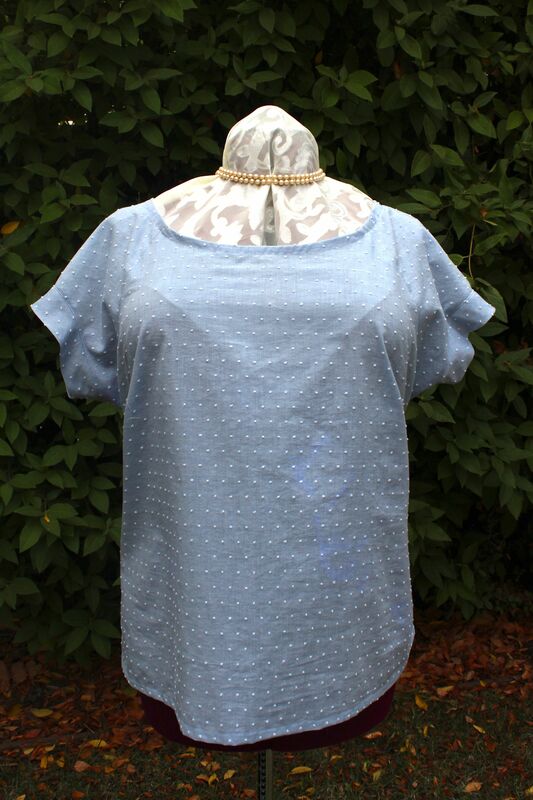 It’s an easy-to-sew top that has nice details and is very comfortable. I was hoping I could substitute tops made from Belcarra for the cheap knit Target tops I buy every year, and I think I can. But the sewing wasn’t smooth sailing all the way through. 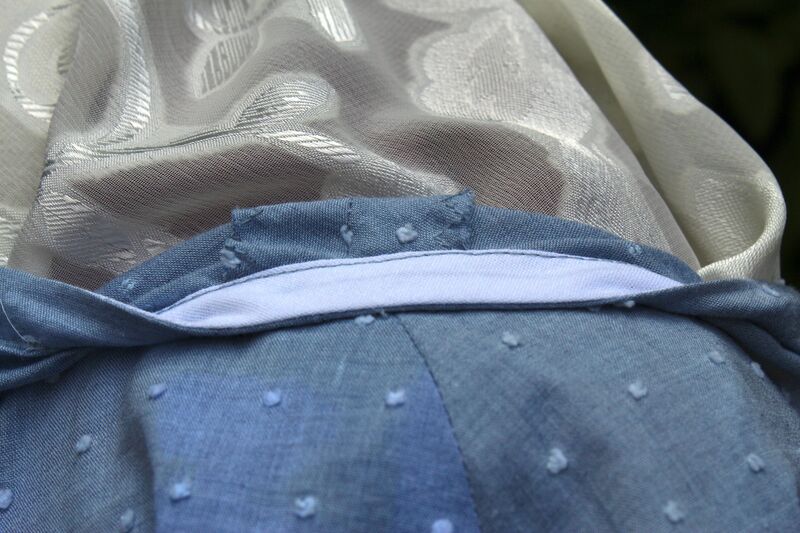 The neckline is finished with a bias band that is folded wrong sides together the long way, then sewn to the right side of the neckline, flipped to the wrong side and sewed down. Somehow, I REALLY goofed this up. The band piece ends up 1-inch wide when folded, and you’re supposed to use a 5/8-inch seam allowance. That would leave a 3/8-inch flap to turn to the wrong side all the way around. I used my 5/8-seam allowance pressure foot and still ended up with an uneven flap. It varied from 3/8 of an inch to 1/8 of an inch. Rather than rip it out and start again, I trimmed the seam allowance close, folded the flap to the wrong side, and used a decorative topstitch on the right side that would be sure to anchor the flap down no matter what the width. The pattern refers to this as a cuff, but I’d call it a band. 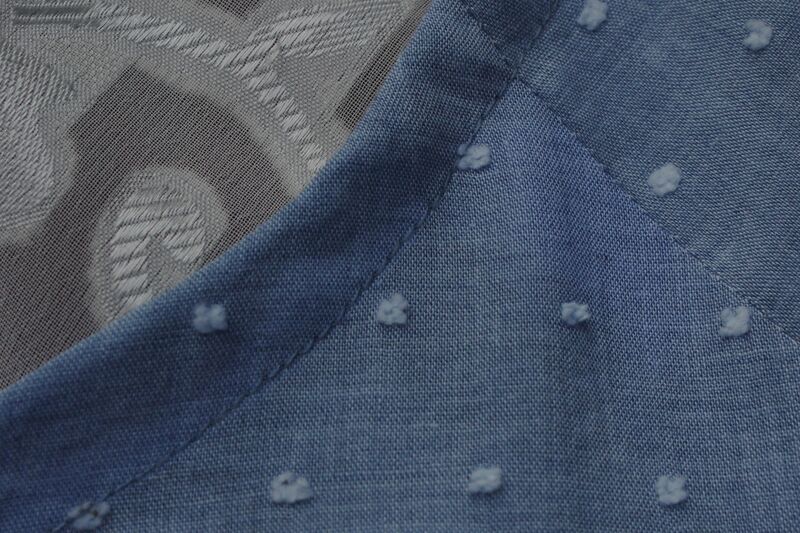 The fabric is more interesting up close. You can really see the detail of the fluffy pindots here. The bands looked so clean and nice that I decided I hated the topstitching. HATED IT. So I ripped out all the topstitching and attempted to rip out the neck band seam. Well, I had trimmed the seam allowance so close that I was just ripping the edge of the neckline. So I cut it all off as close as I could. Ugh. This looks SO much better than the topstitch I had before. Clean and pretty. And still done in a day. Eliminating the neck band would reduce the fabric needed by a decent amount, so I may skip it in the future and just use bias tape. Or, I might see if I can actually execute the neck band properly. I think I’d take a smaller seam allowance next time. I’ll raise the darts another 1/2 inch. I’ll lengthen the top 1 inch so I can do a more substantial 1 1/4-inch hem instead of a 5/8-inch double fold hem. I’ll straighten the side seams. I don’t need hip room. At all. With these adjustments, I’ll have a perfect top that sews up quick. I’ll keep it in mind for any nice cottons I see at Jo-Ann’s. 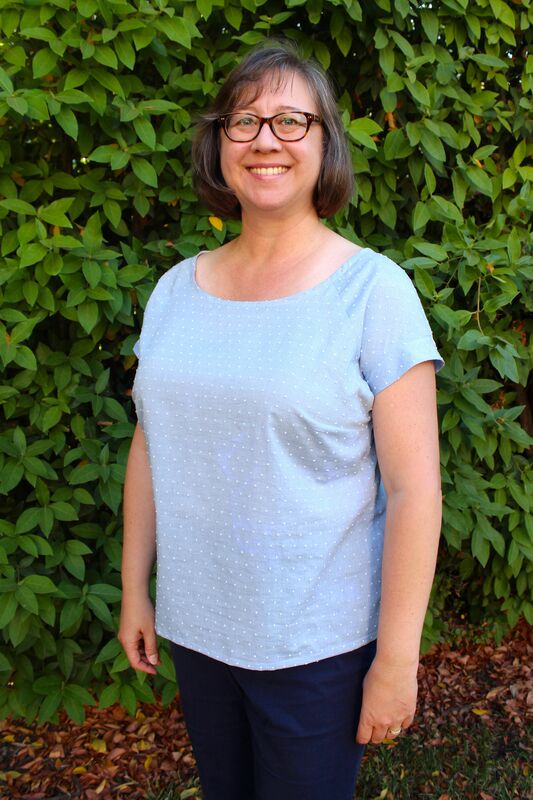 I’ll be looking to the great Belcarra Blouses I saw on Sewaholic’s site (I particularly like the ones in eyelet) for inspiration on other ways to use this pattern. It’s so satisfying to sew up a quick project here and there. 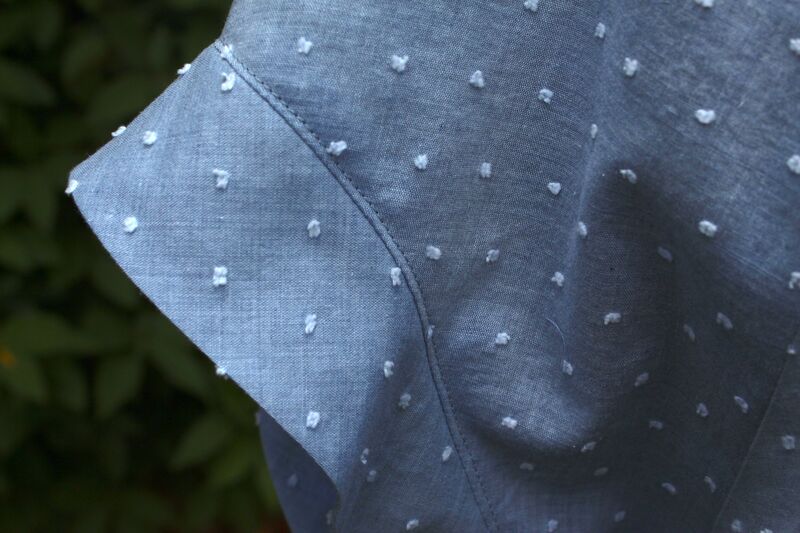 Now I want to make a full denim or chambray skirt to wear with this top. Thank you! I really want to whip up another one or two.